Managing the backup is as equally significant as configuring it. Most of the time, efficient management of incrementals turns out to be tedious as it ends up consuming a huge chunk of disk space on the storage repository. 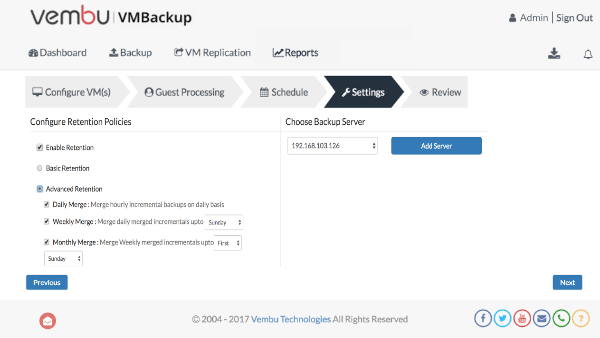 The retention policy of Vembu VMbackup is an efficient option which resolves this issue as it defines the duration of the restored points of the configured backup that is to be deployed on the Vembu Backup server. It further allows the user to save additional disk space on the backup server as it purges the incremental backups periodically and even choose whether to configure these retentions or not. 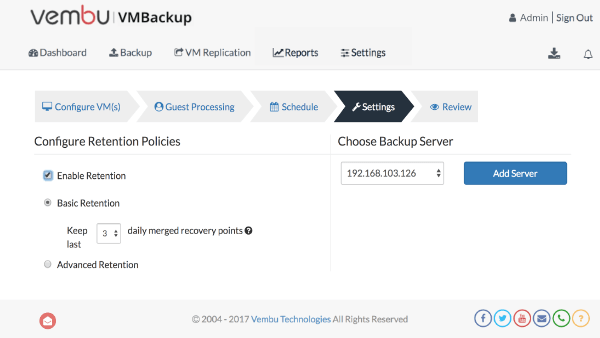 The Basic Retention policy of Vembu VMBackup is designed to retain the restore points for the shorter period of time, the user can select the number of restore points that should be retained on the backup repository. With basic retention policy, daily merged recovery points will be created by merging all the hourly incremental backups of the particular day on the first successful incremental backup of every successive third day. The Advanced retention policy is designed to retain the incremental data for a longer period of time. Every incremental backup will be periodically merged on daily, weekly and monthly basis representing son, father and grandfather. This Grandfather-Father-Son method is letting the users to maintain consistent restore points at periodic intervals.